Maybe You Are Asking The Wrong Questions? Questions are dangerous things. To question means that we are prepared to engage in the risky task of letting go of what we thought we knew and to admit not knowing. Perhaps that’s why ego is one of the great barriers to questions. In a society that often prides itself in the pretense of knowledge, questioning has fallen out of favour. We no longer see the value of questions or we have been told to avoid them (such as in some cult or extremist religions). Yet questions are the key to innovation and growth. Questions can change our world. Never stop asking questions. 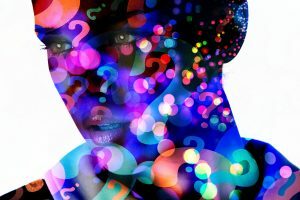 Social change, transformation, innovation and the growth of companies and industry has often been the result of a single question. For example, “Why can’t I have the photo immediately,” was the question of a 3-year-old to her father, Edwin Land. The result of that question was the invention of the polaroid camera. “A beautiful question is an ambitious yet actionable question that can begin to shift the way we perceive or think about something – and that might serve as a catalyst to bring about change,” writes Warren Berger in his excellent book, “A More Beautiful Question: The Power of Inquiry to Spark Breakthrough Ideas.” But like Primo Levi points out, often we are conditioned not to question – and that has to do with power. Berger writes, “To encourage or even allow questions is to cede power.” If you take a look around you at social, religious or political settings that are dying and filled with fear you will find a common denominator – they have shut down questions a long time ago! If you are employed in a workspace or living in some form of community that treats questions with fear and paranoia, you will be unable to live authentically and you will stop growing. Questions are the fertiliser for the seeds that lie dormant in your heart. So, friend, what are you facing right now that needs a new set of questions? What are you afraid of right now that needs you to let go of the safe harbour of certainty so you can go into the uncharted waters of questions? Where are you gagged right now from asking questions? Why are you allowing that setting to silence you? Not to question preserves the status quo. It is time for beautiful questions and to allow your inquiry to unsettle assumptions, a sense of ‘stuckness’, and of fear … it is time to grow! Ask! You must not mistreat or oppress foreigners in any way. Remember, you yourselves were once foreigners in the land of Egypt. Part of the problem in reading an ancient sacred text with modern minds is that there is a disconnect and dissonance in context, culture and thought. When reading the Bible, for example, it is easy to revert to a form of fundamentalist literalism that leaves us with naive absolutism. Some may miss the point that in the Hebrew culture “deed was always more important than creed” (Wilson). For example, when Habakkuk speaks of the just living by ‘faith’ (emunah), it implies an unwavering hope or trust that is backed through deed and action, not just an intellectual acceptance of a set of doctrines! 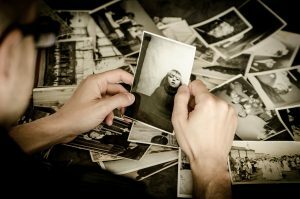 The idea of remembering or to remember (zakar) in the Bible and/or Torah, has to do with far more than just a simple retention of information. Rather, remembering is always accompanied by action. For example, Shabbat, returns every week. She reminds devout Jews that Yahweh is their Creator and Redeemer. 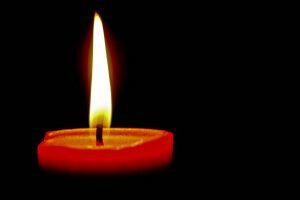 Shabbat calls to action and repetitive observance enforces remembrance. 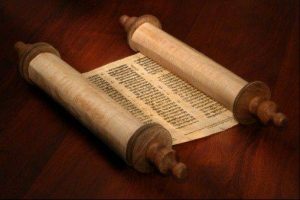 There is an emphasis made throughout this sacred text that purposeful remembrance is very important in everyday life, in the nurture of tradition, and in the shaping of worldview. Why this emphasis? People, or people groups, who forget or deny their past, their story or their language, forget who they really are. Our society’s infatuation with wealth, power and dominion keeps us hyper-active, anxious, and hurriedly forgetful. We, like Gollum in Lord of the Rings, obsessed with the ring of power, forget our name and our story, and with the forgetting we loose all connection with our past and our belonging in this world. We forget that societies that focus on the ‘ring’ seldom find their way back to the ‘Shire’. The study of history is an exercise in remembering. In the collection of our past narratives, we inform, guide, assist and shape our present and future. To forget history, or deny it, is to cut off our belonging through the corridors of time. 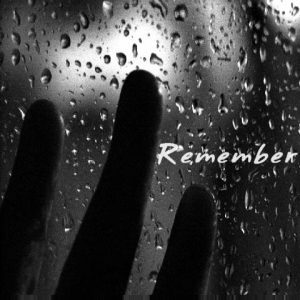 All over the world today we find people remembering with purpose: through festivals, marches, holidays and holy days, memorials and solemn ceremonies, traditions and habits … We are made to remember. Yet to remember is not always an easy task. Looking back we discover that the ancient paths did not just lead through green pastures and beautiful scenery, but there are also times of walking through deserts, storms, and very dark and treacherous moments. It is tempting to remember the good and forget the bad. 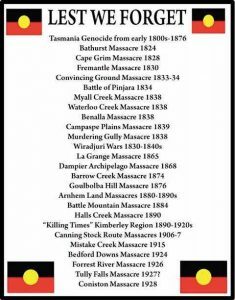 Many Australian history books have done just that for decades – seeking to sanitise the past and educate another generation in a more palatable rendition of the atrocities committed under Colonial rule. My hope is that we will become far more active in recording an accurate version of what transpires on our fair isle. Our children’s children have a right to remember and lament these current days – where we house refugees in concentration camps and where we have allowed the fear, racism and propaganda spread by those in politics to shape our world. Revising history in order to remember is one thing. Denying it takes us to a whole new level. It is heartbreaking to actively remember the holocaust. For many this path is shut. The grief is too overwhelming. For others the enormity of a horrible event in history can be so unpleasant that denial is preferable. It is much easier to ignore, rationalise or deny what has happened. There is a comfort in numbers and often people find each other and feed the denial. It is easy to pass harsh judgement on those who deny the holocaust, for example, yet many of us stand guilty of historical denial in some manner or other. Sometimes it is the denial of our own personal story. So as the end of the year approaches, it is often a good time to spend some moments in reflection … to remember. Zakar, to actively remember, helps us to change our ways. The very action requires a transformation. It brings purpose both into our past, present and future. What are some things that happened this year that you would like to remember? In what active way will you do that? How about starting a journal? Begin to actively write down events, people, or circumstances that have made you who you are and that you want to remember. It takes courage to remember. At times there is much pain before there is any healing. May you be brave, dear friend. May you remember. If you happen to find yourself in Israel on a Saturday you may encounter this peculiar phenomenon when using the elevators: they automatically stop on every level. And if you want to learn from this post, and not make an idiot of yourself like I did, do not go up to the receptionist and tell them that their elevator is out of order. Have compassion on this poor human. After all, how many ‘tourist ignoramisus’ can one person bear?! On Shabbat, many of the elevators work in a special mode to allow Jews to observe Shabbat and abstain from operating electrical switches. It is a day of rest. And in a speed-crazy world we have so much to learn from our Jewish brothers and sisters. The Jewish tradition of keeping Shabbat stems from the Creation narrative and the Torah (Law). 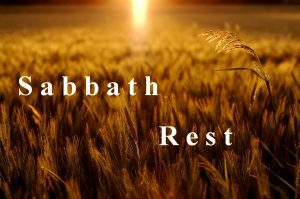 It was a day of rest and worship for the ancient Israelites. Violating Shabbat had serious consequences as the day was considered holy, dedicated to G-d. It established and bolstered Jewish identity amongst other nations and cultures as it was an expression of Jewish faith, a national identity marker. Today Shabbat is considered the most important day in the Jewish calendar and often referred to as “Shabbat HaMalka”, the Sabbath Queen. Whether we are people of a particular faith or not, we can all learn from Shabbat. It calls us to mindfulness. It reminds us that rest is to be celebrated. It is not something to be ashamed of or forced. The centrality of keeping Shabbat is to remind Jews of the release of slavery from Egypt. The Egyptian exile is a metaphor for any enslavement, says Rabbi Becher, be it physical or spiritual. By ceasing work and resting we demonstrate that we are not enslaved to the physical world. When a person is incapable of refraining from work, then they have indeed become a slave! 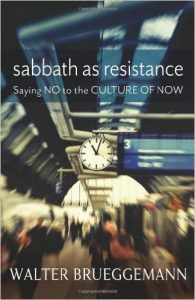 Shabbat confronts us with our own restlessness and constant addiction to activity and engagement. For people of faith, Shabbat is a space that is holy and blessed, and beckons us to connect again with creation and the Creator. In our modern, success-driven, technology-addicted world we stand in danger of loosing our souls in a zombie-like trance of mindlessness. We stand to loose connection to the rhythm of life. Rhythm is the heartbeat that G-d has put as a sacred marker throughout creation to remind us of the sacredness of time and the importance of being mindful of our days. Whether Jewish or not, or whether we are a person of faith or not, considering and learning from Shabbat makes us mindful of this rhythm. It teaches us to listen, to hear, to see … to breathe! On Sunday, I woke up to several unpleasant realities: Australian politics was in chaos, Pauline Hanson had been returned to power, just like Voldemort, and the world has lost one of its most profound voices of conscience – Elie Wiesel. Eliezer Wiesel was born to Shlomo and Sara Wiesel, on the 30th September, 1928, in Sighet, Transylvania, now part of Romania. Elie’s life evolved around family, community and religious study. He had three sisters. His mother encouraged him to study the Torah and Kabbalah. Elie was deeply influenced by his father’s liberal expressions of Judaism. He spoke Yiddish at home, but also learnt Hungarian, Romanian and German. When Hungary annexed Sighet in 1940, the Wiesels, like many other Jews, were herded to the ghettoes. Then in May, 1944, they were deported to Auschwitz-Birkenau, by the Nazi Regime. Elie was 15. He ended up in a sub-camp, Auschwitz III-Monowitz, with this father. They worked at a nearby Buna rubber factory. The conditions were hellish – starvation, beatings and despair, were all part of the daily routine. 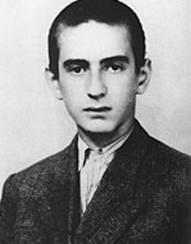 In 1945, the Russian Army drew near and Elie and his father were hurriedly evacuated to Buchenwald. Three months before the camp was liberated, his father was beaten to death by German soldiers. His mother and younger sister, Tzipora, also lost their lives there. Buchenwald was liberated in 1945. Elie and his two sisters, Beatrice and Hilda, were the only survivors from his whole family. How do you begin to put the pieces of a life, gutted by violence and horror, together again? Very, very slowly. 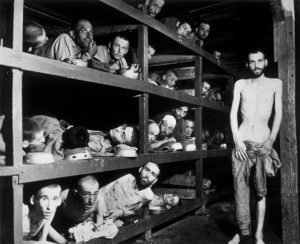 It took Elie ten years to begin to articulate some of his experiences in the death camps. Before that, he had studied in Paris and was a journalist for the French newspaper, L’arche. It was through the encouragement of Francois Mauriac, that Elie began to write about life in the death camps. 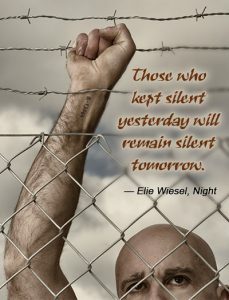 His memoir and first book, Night (La Nuit), has become one of the most critically acclaimed of all Holocaust literature. Elie became an American Citizen after an accident left him unable to renew his French documents – documents which previously had allowed him to travel as a ‘stateless’ person. He settled in New York and became an increasingly prolific writer, authoring over thirty books. In 1978, he was appointed chair of the Presidential Commission on the Holocaust. He dedicated his life to the plight of persecuted people groups and ensuring that no one would forget what happened to the Jews. He was the recipient of the Nobel Peace Prize in 1986. He was also honoured across the world with a number of awards which included the U.S. Presidential Medal of Freedom and the French Legion of Honor’s Grand Croix. 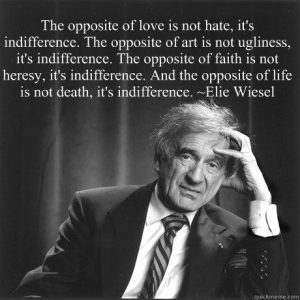 Elie and his wife, Marion, founded the Elie Wiesel Foundation for Humanity to “combat indifference, intolerance and injustice” throughout the world. They had one son, Elisha. A timeline of Elie’s remarkable life can be viewed here. He died on July 2, 2016, in his home in Manhattan, at the age of 87. Elie Wiesel had a profound influence on my life. His book, Night, shook me to the core and I would recommend it as a must read for all who are serious students of human rights and the Holocaust. Indifference elicits no response. Indifference is not a response. Indifference is not a beginning; it is an end. And, therefore, indifference is always the friend of the enemy, for it benefits the aggressor — never his victim, whose pain is magnified when he or she feels forgotten. The political prisoner in his cell, the hungry children, the homeless refugees — not to respond to their plight, not to relieve their solitude by offering them a spark of hope is to exile them from human memory. And in denying their humanity, we betray our own. May we take a moment to consider this dire warning from a man who has seen some of the greatest horrors that this world can hold. 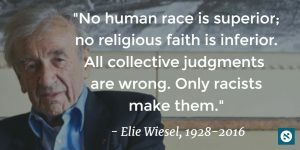 RIP Elie Wiesel – You have run a great race.